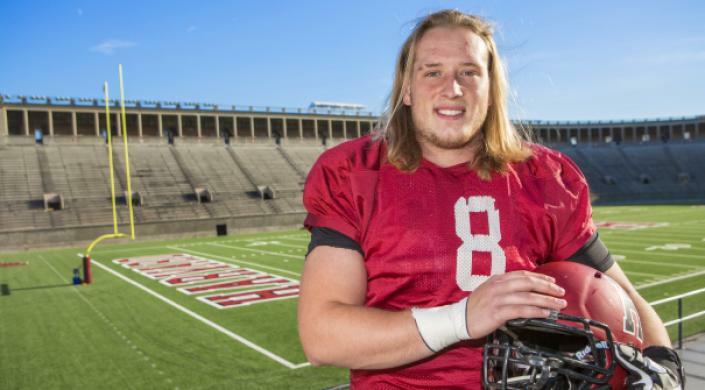 On the gridiron, Harvard Crimson football player Paul Kaczor enjoys the adrenaline rush as he goes helmet-to-helmet with the opposing team. 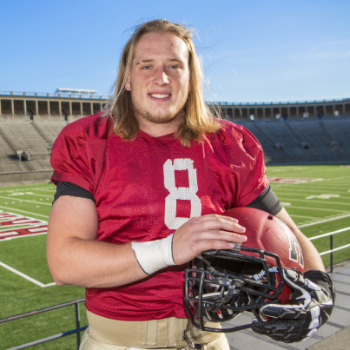 But the six-foot-four, 280-pound lineman gets even more satisfaction putting his head together with peers on engineering design projects at the Harvard John A. Paulson School of Engineering and Applied Sciences (SEAS). How did you initially get involved with football? I think the first time I ever put on pads and a helmet was when I was in fifth grade, but I’ve been playing catch and watching high school football games since I was in diapers. All my older brothers played college football and my dad coached football at the high school that I attended. I never expected to play football here—I remember how completely shocked I felt when a football coach from Harvard came to my high school to recruit me. So you came here ready to play football. Was engineering on your radar? Not at first. I originally wanted to concentrate in astrophysics. When I came to the concentration fair, I gravitated toward SEAS because I met some really great people. I thought, if these friendly, interesting people are all going to be engineers then maybe I should be an engineer too. I was also really drawn toward the collaborative environment that SEAS provides. Why did you decide to concentrate in bioengineering? I’m really interested in the design of medical devices. Eventually, I’d like to work on devices in the cardiac area, developing pacemakers and ICD [implantable cardioverter-defibrillator] units to help people with arrhythmia, AFib (atrial fibrillation), and different heart defects. Heart disease is a huge issue in the U.S. and all over the world, and I’d like to do something to make a difference. From a personal standpoint, my mom, Ruth, has AFib. She’s been on a pacemaker for a little over a decade now. She and I talk about it a lot. In two of my courses, Engineering of Nanostructures for Targeted Drug Delivery (ES-165) and Medical Device Design (ES-227), I tied cardiac medical devices into my projects, and my number one resource was my mom. Have you worked on a collaborative project that has been especially rewarding? In Engineering Problem Solving and Design (ES-96), I was on a team of students that developed a robotic meat smoker. That project was epic. We were pulling crazy hours, staying up all night smoking brisket. It was unbelievably fun, though. I’m a big guy—I play offensive line—so I know how to eat. Anytime I get to do an engineering project where the end result of my experiments is just tons and tons of smoked meat, that’s going to be fun for me. Through that project, I learned that engineering really requires a strong sense of dedication. When you are working on a project, as soon as you go from thinking and designing and drawing on paper to actually building something, the time that goes into it spikes exponentially. Speaking of time management, how do you balance your coursework with your demanding football schedule? It is not always ideal. Football is a huge commitment. We have lifts most mornings, so I’m up really early exerting my body and tiring myself out. After that, going to class and paying attention is tough, and then I have to transition right back when I head across the river for a full padded practice. By the time I get home, at about 8 p.m., I walk in the door and realize I still have four or five hours of homework to do. I have to stay focused. The collaborative environment at SEAS makes it a whole lot more doable. If I had to sit down at 8 p.m. and do five hours of homework by myself, I’d have no shot. But I can walk into a dining hall, sit down, and work with some of my classmates. It really helps to motivate and encourage me. The team started this year with seven straight wins and is coming off a perfect season and an Ivy League championship. It has to be exciting to be on a team like that. But with such a demanding schedule, is it worth it? Absolutely. Every student needs some outlet to express all the stuff that gets bottled up while they are sitting around and reading and thinking all day. For me, that’s football—going out on the field and just running around, being physical, is an exhilarating experience. It’s not necessarily a break from the mental exercises, though. Many people don’t realize that football is a highly intellectual sport, with lots of strategy and technique. In the end, my teammates truly make it all worthwhile. They are a really exceptional group of guys. Besides another Ivy League Championship, what else is in your future? I’d like to pursue some form of graduate education, possibly business school. I see business school as an opportunity to try another facet of life. Football will definitely still me a part of my life, too. If I’m not playing, I’d at least like to watch my younger siblings who are still playing high school football. I’ll always love the game.